We’d love your help. Let us know what’s wrong with this preview of The Moon Is Always Female by Marge Piercy. “The poems in this volume fall into two parts. Hand Games, poems of the first section, is the daily bread of my past two years or so. They are the artifacts of loving in a personal way, of struggles in a wide and a narrower frame, of planting and harvesting in the earth and on paper, of building new friendships and mourning the death of friends. They speak of zucchini and “The poems in this volume fall into two parts. Hand Games, poems of the first section, is the daily bread of my past two years or so. They are the artifacts of loving in a personal way, of struggles in a wide and a narrower frame, of planting and harvesting in the earth and on paper, of building new friendships and mourning the death of friends. They speak of zucchini and oaks and cats, of jogging and writing, of nuclear power plants and suicide, of fat and of street hassling. ”The Lunar Cycle forms the second part. I first heard of the lunar calendar in my childhood, when I asked why Passover falls on a different date every year and was answered that it falls on Nisan 14, the fourteenth day of the lunar month of Nisan. The next time I came across the moon-month was in reading Robert Graves in search of the old goddess religions. But the lunar calendar has really only been an intimate part of my life since I moved near the ocean and the bay and had to become conscious of the tides; for one thing, to get the sweet Wellfleet oysters. For more precise understanding I owe a lot to Nancy F. W.Passmore of the Luna Press, who every year produces The Lunar Calendar with thirteen months, their old Celtic names, associations from around the world, time of moon rise and set and all the phases. It tells me at a glance when my period will come and when I can expect to ovulate, and it is the most beautiful calendar I have ever seen, with the months in the form of spirals rather than grids. To ask other readers questions about The Moon Is Always Female, please sign up. A beautiful collection, if a little short, I really felt connected to her inner beliefs, and feelings. Not just as a poet, but as a person. I think she would make a great friend. The poems are a perfect blend of the gutsy and raw, the lyrical and the meditative. Some I felt the need to speak out aloud, I wanted to hear the words not just read them. She also conjures up such imagery and wonder, with a deep and concise mind, a touching human soul. A vast array of emotions was opened up. Very impre A beautiful collection, if a little short, I really felt connected to her inner beliefs, and feelings. Not just as a poet, but as a person. I think she would make a great friend. The poems are a perfect blend of the gutsy and raw, the lyrical and the meditative. Some I felt the need to speak out aloud, I wanted to hear the words not just read them. She also conjures up such imagery and wonder, with a deep and concise mind, a touching human soul. A vast array of emotions was opened up. Very impressive. "A woman is screaming and I hear her. that we open and lie under and weep. rock by slippery rock into the mists. or been willing to be or become a man. 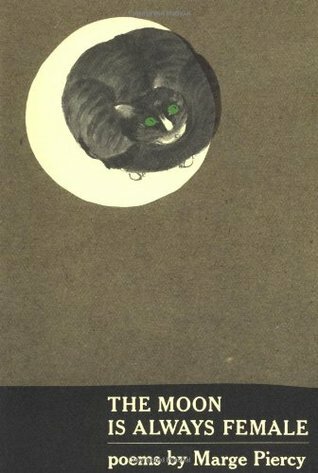 Written at the start of the middle of Piercy's career, The Moon Is Always Female includes some of her strongest poems and many of her most meditative. The two-part collection refines the rawness of much of the poet's early work, dialing down its fury a bit and more carefully moving from image to image, poem to poem. It also develops the interest in Jewish identity, rituals, and faith that would come to define Piercy's verse as she aged. Nearly every time I've gone to the bookstore, I've ended up with this book. Our first meeting was a bit of an accident: I'd actually been looking for something by Sylvia Plath but got distracted by Piercy's title. That statement--the absoluteness--was wholly seductive, wholly haunting. So, instead of buying it, I siphoned bits of its beauty, year after year. For five or so years this went on. No matter what or who I'd intended to buy, I'd come back to this, read enough to satiate myself and bid a Nearly every time I've gone to the bookstore, I've ended up with this book. So, instead of buying it, I siphoned bits of its beauty, year after year. For five or so years this went on. No matter what or who I'd intended to buy, I'd come back to this, read enough to satiate myself and bid a fated adieu. I guess I never bought the book because I enjoyed our clandestine affair. When I'd open it after not having seen it for weeks or months at a time, every word was more final. With just a few words, I'd get full and leave full, like the moon. But it almost felt wrong, buying it--stealing the moon away like that. I wanted to leave it there for someone else to happen upon, just in case. That's the stuff. So much wisdom and beauty here, and so much... recognition of the way life really is, if you're a woman, anyway. Favorites: "The Inside Chance" and (for more than 20 years now, and probably forever) "Right to Life." The rating would actually be a 2.5 as the imagery is good. I really expected to love this collection but it was just too focused on the negative and it brought me down. My favourite poetry brings me to a quiet place of thinking and pondering but this brought me to a place of despair and that is not a collection that I am going to keep in my possession and visit again. I am not usually a poetry reader but many of the poems in this book stopped me in my tracks. Marge Piercy knows how to get to the core of the matter and fully describes feelings and experiences I have had. blacken the sunlight I am not usually a poetry reader but many of the poems in this book stopped me in my tracks. Marge Piercy knows how to get to the core of the matter and fully describes feelings and experiences I have had. in the morning early and busy together." I came across this book at random at a local used book store. From the title, I expected, fluffly, trite, possibly pagan, probably feminist poetry. A confession - I looked at it to make fun of it. Instead, I found myself moved by the first poem I read. I flipped to another random page, sure that was a fluke. The next poem gripped my heart as well. I repeated that twice more before realizing that if I didn't buy the volume, I was going to sit myself down right there and read it in the store. I to I came across this book at random at a local used book store. From the title, I expected, fluffly, trite, possibly pagan, probably feminist poetry. A confession - I looked at it to make fun of it. Instead, I found myself moved by the first poem I read. I flipped to another random page, sure that was a fluke. The next poem gripped my heart as well. I repeated that twice more before realizing that if I didn't buy the volume, I was going to sit myself down right there and read it in the store. Took me a while to warm up to this collection, but it did finally pick up speed. I love the abortion poems, especially those about the clinic workers. It makes the issue real by linking it to real people who don't have any medical stake in what's going on---they're just doing their jobs. Piercy's feminist tone is back again but softened in the decades after To Be of Use. Still love her, though! A rich book of often feminist poetry. There's a reason this is a classic - there are some excellent poems here and very few weak ones. It's hard to pick a favourite, but here is the first stanza of 'For the young who want to', a poem to which I think I'll be returning: "Talent is what they say/ you have after the novel/ is published and favorably/ reviewed. Beforehand what/ you have is a tedious/ delusion, a hobby like knitting." The title poem is one I've long loved and will continue to do so. I'd return to ten or so of the other poems in the collection. While many contain fine, surprising lines, there is a tendency to err on the overtly rhetorical side, which lessens the overall grace. The poems are fantastic. I felt like we were soulmates. If someone gives you a Marge Piercy book, it might be because they love you. If you find yourself welling up with tears with each passing page, it might be because you love them back. Thank you, Nammy. I wept, I smiled. This book is such a treasure. women's intimacy shines in these poems. This is a truly remarkable collection. Several were astoundingly well-crafted poems. One of the most important pieces of women's literature ever. Also essential for anyone who is squirming in this WTF nightmare political climate. This baby should be flying off the shelves again. My absolute favorite book of poetry! I have a mis-printed edition. The poems end on page 135 with a note on the type--and then restart on page 103. So I have 31 duplicate pages at the end of the book. Probably my favorite book of poem, esp. the first portion of poems around everyday life. Some good lines but it reads like sentences than poetry. Piercy was born in Detroit, Michigan, to a family deeply affected by the Great Depression. She was the first in her family to attend college, studying at the University of Michigan. Winning a Marge Piercy (born March 31, 1936) is an American poet, novelist, and social activist. She is the author of the New York Times bestseller Gone to Soldiers, a sweeping historical novel set during World War II. to roll on my back and wriggle. but I want to start digging and planting.